ROCHESTER, N.Y. — Food and drug chain Coborn’s Inc. plans to add PharmaSmart blood pressure kiosks at its pharmacy locations. PharmaSmart International Inc. said Monday it’s slated to deploy its BP and health screening stations and cloud-based Health IT platform at Coborn’s 36 supermarkets with pharmacies, operating under the Coborn’s, Cash Wise Foods and Coborn’s Marketplace Foods banners in Minnesota, South Dakota and Wisconsin. Plans also call for PharmaSmart kiosks to roll out to Coborn’s two clinic pharmacies and the retailer’s support center in St. Cloud, Minn.
Coborn’s aims to leverage PharmaSmart’s clinical-grade program and McKesson CPS integration to help meet Medicare Star Ratings goals, particularly measures D-14 (medication adherence for hypertension), and C-19 (controlling blood oressure). Both are triple-weighted measures of high interest to national and regional insurers, according to PharmaSmart. Overall, St. Cloud, Minn.-based Coborn’s operates 54 supermarkets across Minnesota, North Dakota, South Dakota, Iowa, Illinois and Wisconsin under the Coborn’s, Cash Wise Foods, Marketplace Foods and Save-A-Lot banners. Coborn’s also owns CobornsDelivers, an online grocery ordering and home delivery service, and stand-alone convenience, liquor, video and pharmacy outlets, for a total of 120 retail locations. 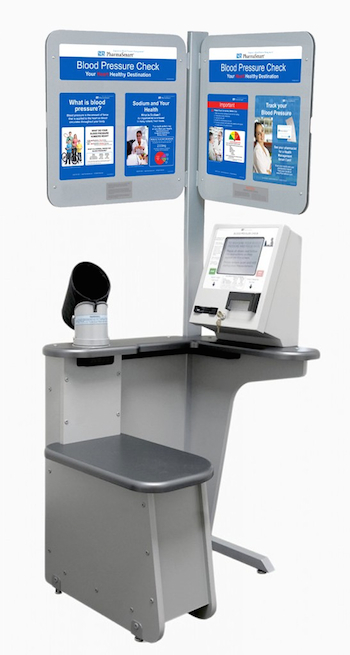 PharmaSmart kiosks serve more than 7,000 retail locations in the United States and Canada, including chain drug, supermarket and discount stores, among other venues. Its PS Data Smart Health IT database holds over 50 million targeted patient BP readings. PharmaSmart’s BPT Rx integration with McKesson’s Clinical Programs Solutions (CPS) synchronizes PharmaSmart patient data with Mckesson’s EnterpriseRx pharmacy management system.